Kawai-jinja Shrine is within the grounds of Shimogamo Shrine, but it’s worth a visit in its own. It enshrines “Tamayorihimemikoto”, daughter of deity in Shimogamo-jinja, and worshiped as the guardian angel of the woman. 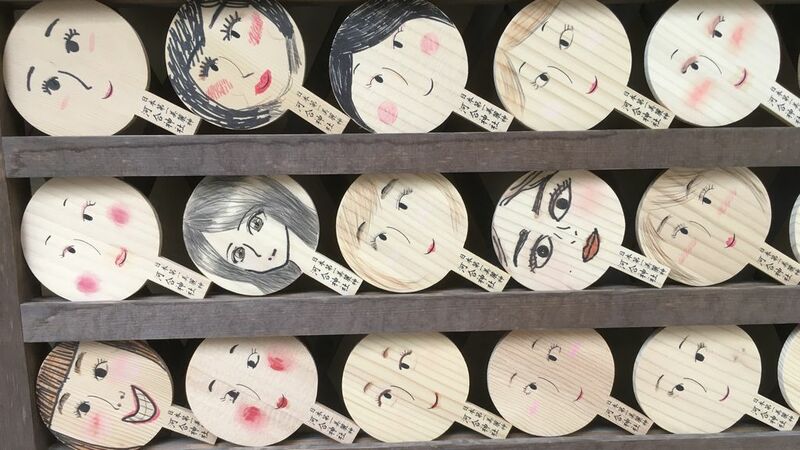 It has a reputation for beauty, and so you will see many young women buying mirror-shaped wooden plaques “kagami-ema” and then painting their ideal faces on them with make-up before hanging them on the shrine wall. It’s fun to spend a few minutes looking at these portraits, many of them pretty and a few funny or you could paint your own. In the shop beside the entrance to the shrine, you can buy a glass of ““beauty water”, which is actually juice made from quinces grown in the shrine grounds. These contain various vitamins which are said to be good for the skin.